The tale again comes to us from the pen of Murgen, Annalist and Standard Bearer of the Black Company, whose developing powers of travel through space and time give him a perspective like no other. Led by the wily commander, Croaker, and the Lady, the Company is working for the Taglian government, but neither the Company nor the Taglians are overflowing with trust for each other. Arrayed against both is a similarly tenuous alliance of sorcerers, including the diabolical Soulcatcher, the psychotic Howler, and a four-year-old child who may be the most powerful of all. (goodreads.com). She is the Darkness was a much better read than the previous book. It was much more understandable and interesting. I still don’t like Murgen much as a narrator. There just isn’t much dialog anymore, at least not as much as there was with Croaker. Murgen’s story is a little more entertaining now, however, so I am starting to get to know him a little better. Hopefully, I will learn to enjoy his narration. The plot finally moved forward a little in this book instead of focusing on past events. I thought it moved at a pretty good pace and there were lots of small battles and other events that kept me interested. For one, Goblin’s adventure was intriguing because I didn’t know what he was up to and I just wanted to know. Also, One-Eye’s disappearance was interesting as well. There were also quite a few battles in this book as the Company tries to take down the Shadowmaster! Pretty epic! Also, the ending was amazing!! Can’t wait to read the next book! There wasn’t too much wrong with this book like there was with the previous. Murgen’s situation is a lot clearer now and he doesn’t switch between the past and present without notice. This time we just get to see a lot more of his ghostwalking with Smoke and enter more of his dreams. It ended up being very interesting by the end of the book. As always I love (or hate) the chracters in this series. They are all developed so well and are very entertaining. I am glad that there was more of One-Eye in this book, however Goblin was absent. 😦 I love Lady and Croaker, so any mention of them is awesome. There was a lot more of them in this book even though it is through Murgen’s perspective. I am very pleased with Cook’s characters and their development. She is the Darkness was a much better read than the previous one so stick with the series. If you find the book to be a little slow don’t worry because it picks up about half way through and you can’t miss the ending! If you enjoyed all the other books than you must continue with this series. 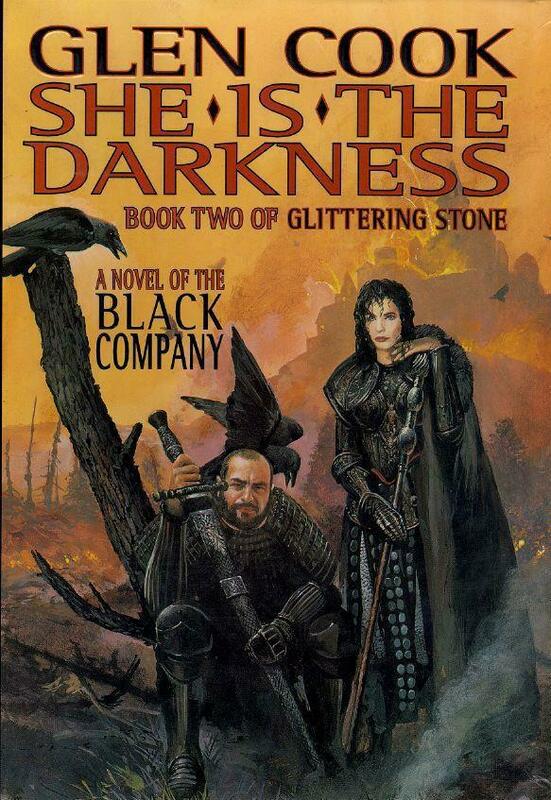 If you are new to the series than I strongly suggest starting with the first Black Company books. Reading these in order is a good idea. I recommend reading the omnibus version of this book! I love this series. I’m so looking forward to what you think of how it ends! One of the most unique endings EVER. P.S. I like the blog’s new look! Thanks! I have really been working on my blog recently and am enjoying the new look as well! I really am enjoying the series. Has to be one of the best ever, but I wont ever forget those first 3 books. Definitely the best!